Men’s silk boxers by Royal Silk® in an ornate, rhythmic design of rippling pink and white. Styled in buttery soft Satin silk, a silk so smooth that it will feel like a second skin. Try this pair of silk boxers and you will know how comfort can feel so sublime. 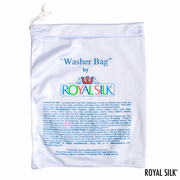 Hand wash or dry clean, easy instructions are included. 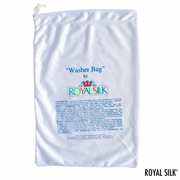 To machine wash, we recommend our fine mesh Washer Bag that is sold separately in two sizes. Available for waist sizes: S (30-32"), M (33-34"), L (35-36"), XL (37-38"), 2XL (39-40"), and 3XL (41-42"). The boxers are full cut with lengths ranging from 16.5" to 17.75" for sizes S to 3XL. Inseams are about 5.5" for all sizes. Three-panel construction allows for roomy comfort. Full-sized fly front with single-button opening. Single-button fly closure features 0.5" mother-of-pearl button. Extra button included. 100% silk boxers. Imported. $39.